It is often written that there is no indigenous “Alabama-style” of barbecue and it seems that circumstance may be a key to our abundance of options. Opinions about barbecue in Alabama – indeed, throughout the South – are as strong as those about football, religion, or politics. Everybody has a favorite place and favorite style and it is often based on tradition and habit as much as quality and taste. I don’t put much stock into website rankings, but a 2014 online study by “Estately Blog,” using five statistical criteria for all fifty states, ranked Alabama as the most “Barbecue-Crazed State in America.” Among the criteria in which Alabama ranked highest are the overall percentage of restaurants devoted to barbecue (1st — 8.27% of all restaurants in the state are barbecue places according to this report) and number of barbecue restaurants per capita (3rd). I have seen previous reports that ranked Alabama as 1st in that “per capita” category also. With such an abundance to choose from, I long ago stopped taking the time to grill out or barbecue since there are so many better options from which to choose. A few days ago, I saw another online article with the title “Are These the Most Iconic Restaurants in Every State?” I try to avoid those articles because it’s inevitable that they’ll annoy me; that’s the reason they’re there. But it was about food and I had to take a look. Before I opened the webpage I began to imagine the possibilities and the various ways to define “iconic” and wondered what might be the selection for Alabama. Candidates that immediately came to mind were Highlands Bar and Grill, the fine dining restaurant in Birmingham’s Five Points South; The Bright Star, the Bessemer institution for over a century; and Dreamland, the superior barbecue joint in Tuscaloosa. The website’s choice, alas, was Big Bob Gibson Bar-B-Que (www.bigbobgibson.com) in Decatur. Congratulations to them for their designation but this is one of those selections where personal taste has to speak up. (“They’re not even the best barbecue in Decatur,” said a friend who is a longtime resident of Decatur.) I was aware of Big Bob Gibson’s and know they are a force on the competition circuit. I even like their food fine. But it seems that their “iconic” status is based on something this Alabamian was unaware of until he moved to the Tennessee Valley of north Alabama: white sauce slathered on barbecue (chicken, usually). This is not a béchamel but a mayonnaise-based sauce for barbecued meat. White sauce is a staple for most barbecue places in this part of north Alabama. I was unaware of its existence until I moved to the area over twelve years ago. I tried it out – more than once and at more than one place – and I don’t like it. I like all of the ingredients – mayonnaise, vinegar, pepper, occasionally horseradish – but I declared the combination “nasty” the first time I tried it and have not waivered on subsequent attempts. I know people who love it and they are entitled to their taste. It’s not for me. I have met people who claim that they ship it by the case to people who want it and can’t get it in other parts of the country. Feel free to give them my share. Please. To add insult to injury – and I think this was fueled by the Food Network – the sauce is now commonly being referred to as “Alabama sauce.” I first heard this appelation on the Food Network and have now encountered it in other national media including PBS. This rankles me a bit. I could live with it being called “Decatur Sauce” or “Tennessee Valley Sauce” or “North Alabama Sauce.” Jim ‘n Nick’s, a Birmingham stalwart, refers to it as “Morgan Co. White Sauce.” I’m good with that. But I find that white barbecue sauce is an anomaly outside north Alabama. And my vote is for it to stay that way. Since the website listings of “iconic” eateries chose to represent Alabama with barbecue, I began to brainstorm my favorite Alabama restaurants for barbecue. The first names that came to mind were places around Birmingham and the part of Alabama that is most familiar to me. I have eaten Bob Sykes Bar-B-Q (www.bobsykes.com) most of my life. Its location in Bessemer, just outside Birmingham, is always busy and the product is consistent. It’s a good sauce and the pulled pork is my favorite. Jim ‘n Nick’s Community Bar-B-Q (www.jimnnicks.com) is a Birmingham-based brand that has only been around since 1985 (short-lived by barbecue standards) but has quickly become iconic with its support of community, locally grown ingredients, and far-reaching philanthropy backed up by truly high quality product. There are now Jim ‘n Nick’s in a number of states and the corporate and quality policies are consistent throughout the franchise. Corporate policy forbids freezers at Jim ‘n Nick’s. For me, and for many Alabamians who grew up away from the pull of Big Bob’s white sauce, the barbecue mecca for Alabama is still Tuscaloosa County. There is some difference of opinion on who tops the Tuscaloosa ‘cue culture but it’s a happy dilemma since the debate focuses on two long-time joints – Dreamland and Archibald’s. 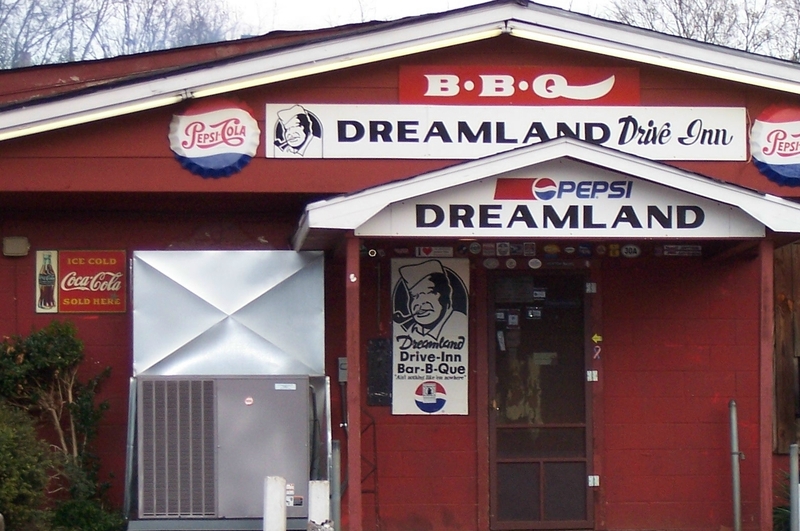 The original Dreamland (www.dreamlandbbq.com) was opened by “Big John” Bishop in 1958, the year Bear Bryant came to coach at Alabama. It is located in the community of Jerusalem Heights in southeast Tuscaloosa fairly near US Hwy. 82 and I-59/20. Turn onto Jug Factory Road, drive the curvy road to the top of the hill, and take a right to Dreamland. Follow your nose if you get turned around and you will sometimes know the place by the happiest parking lot dogs to be found. Dreamland has franchised and can be found in other locations but Jerusalem Heights, the “OG,” is the end of the barbecue rainbow for me. The original place used to serve only ribs and white bread (“No Fries, No Slaw, Don’t Ask” said a sign over the register at one time) and that is enough. It’s a cinderblock temple with noisy screen doors. “Alabama” is a Native American word meaning “Here We Rest” and that is the phrase that comes to mind whenever I am in Mr. Bishop’s original Jerusalem Heights establishment. The ribs are available as a sandwich, a plate, or a slab, and the sauce is amazing with sweet undertones beneath a bold vinegary bite. While I would have to vote for Dreamland as the best and most iconic barbecue in the state, cross the river from Tuscaloosa into Northport and there is amazing and even more rustic competition from Archibald’s. The late writer Barry Hannah introduced me to Archibald’s in the early ‘80s. It is basically a shed surrounding a pit with a few seats on the inside and a few picnic tables around the small parking lot. The menu is minimal but the quality is splendid, and the sauce is more mustardy. Archibald’s is a little bit off the beaten path and I haven’t eaten there nearly as often as I’ve eaten at Dreamland but I’d venture to guess that if I had been introduced to Archibald’s first, it might be my favorite. As it is, it’s almost a toss-up between Dreamland and Archibald’s for me. And there’s not a drop of white sauce to be found at either place. This entry was posted in Alabama, barbecue, food and tagged Alabama, Alabama sauce, Archibald's barbecue, barbecue, Barry Hannah, Big Bob Gibson Bar-B-Que, Bob Sykes Bar-B-Q, Dreamland barbecue, Jim 'N Nick's Bar-B-Q, southern foodways, the south on January 10, 2015 by gedwardjourney. Edward! You are such a Journey! As demonstrated by your attention to food and delicious details. Thank you for the kind comments, Emily. Bob Sykes is your measure for BBQ? You poor thing. No wonder you abhor the white sauce. Bless your heart. I’ll bet you thought Greenbriar ‘que was wonderful, too. Catherine, thank you for reading my essay and for taking the time to comment. I think if you read the essay carefully you would see that my point is that barbecue taste is very personal to each palate and that we tend to prefer those tastes that we grew up with and that are familiar to us. My reasons for mentioning Bob Sykes are personal; I know the family, have had their barbecue all of my life, and do like it although I did not say it is my “measure” for barbecue. Clearly you have some sort of personal attachment to white sauce; it was new to me when I moved to the Tennessee Valley and I don’t care for it. And, as for Greenbrier — which I never mentioned in the essay, I have only sampled their barbecue once; I prefer their catfish.